The fully automatic AC-134 CoolCharge lets you do just that. This premium A/C machine recovers, recycles and recharges air conditioning better faster, safer and more completely than other brands. Since user convenience is key, a large display faces upright on the machine and an optional print features lets you provide results for both you and your customers. The automatic CoolCharge is 100% programmable, so there's no standing over and babysitting the automated recharge and recovery process. Oil that is drained during operation is stored internally in a container, and the simple LCD display will indicate how much needs to be returned to the vehicle system. The filter quality and refrigerant levels are also automatically monitored by the machine. Functions will cease in the event the filter is too dirty or the refrigerant level becomes too low to service the vehicle. One shop might only need a single A/C machine because the unit is completely portable. Massive 12" back wheels and lockable 4" front casters allow you to easily maneuver the machine virtually anywhere in seconds flat and conveniently lock it in place with a foot-activated switch. Don't waste time with inferior recovery machines that waste resources, inefficiently recover coolant and cost you more to use in the long run. 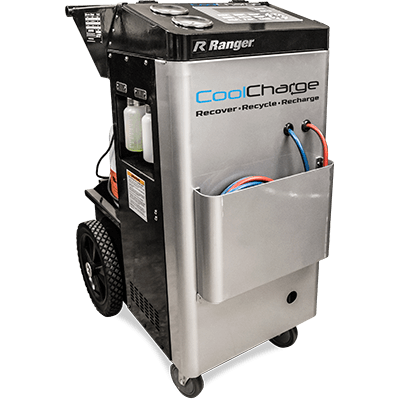 Ranger's AC-134 CoolCharge is the only A/C machine your business will ever need to service most cars, trucks, SUVs and buses (hybrid vehicles excluded).